Is being grateful really going to make a difference in your life? For me, most definitely! Gratitude reminds me of all that I have in my life in the present moment. Instead of focusing on what I don’t have, I focus on what I do have. If you started listing in your mind right now all that you are grateful for, you might surprise yourself. “But what about when you are going through a really hard time and everything seems to be going wrong?” This is a statement I hear from so many people, they tell me its’s okay to be grateful when life is going well, but it’s really tough when you are feeling overwhelmed by events out of your control. I hear you! Life is a series of events that are positive and negative, over the years I have learned that most of my negative experiences led me to a place of healing and acceptance. They taught me to be grateful for each one and learned so much about myself. If it wasn’t for said experiences, I wouldn’t be the person I am today. Of course when you are going through those challenging experiences, you are not grateful for them at the time. Let me give you an example. When we were told that my Sister was very unwell and was expected to die, we were in shock. As a family we came together to support her and be with her as much as possible. On seeing her fading away in front of our eyes, we knew that we were holding onto her, but deep down we knew she wasn’t going to survive this. I remember begging God to help her and that She really needed him right now! I now realise that the help she really needed was to let go and be at peace, she had fought long enough. Now, I give thanks everyday that She was in my life for 27 years and I still hold her in my heart. I now focus on what she gave me in life - unconditional love, and am so grateful that we were lucky enough to have her in our family. Every time I walk now, I bring her with me in my mind and heart, when I am struggling to get up that hill or my back is acting up again, I remind myself to be grateful for my legs, they allow me to walk up the hill and keep me grounded in every challenge - my Sister could not walk. Each time I talk with my friends and family, I give thanks for a voice to speak , being able to express myself. My Sister was unable to speak but for one word she uttered, and that was “Mama”, and for that I am so grateful. She may not have said many words, but to hear her voice expressing this was what we will always hold dear. Being grateful reminds you of what is truly important, during the hard times we tend to dwell on them and forget all the things that are going right. When we look around, we realise that our biggest blessings are the people in our lives. 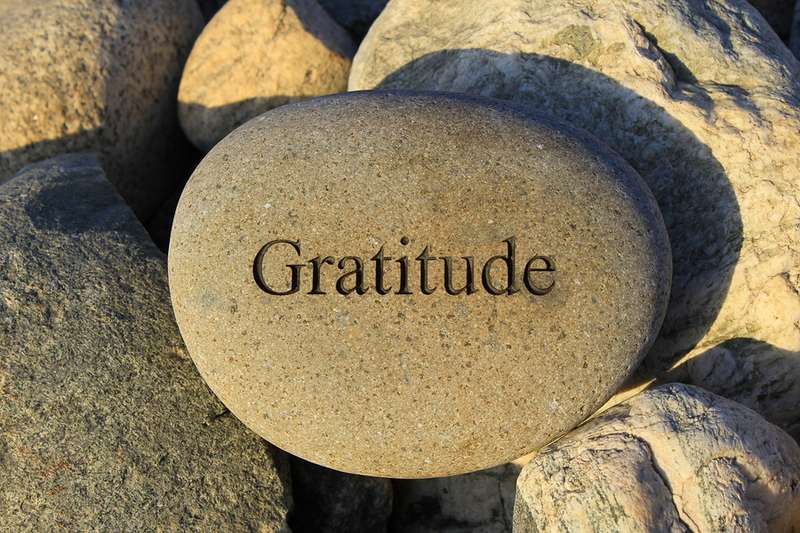 So how can you bring more gratitude into your life? Every morning when you wake, give thanks for being blessed with another day, some people are denied the privilege. Focus on your breath and say silently to yourself “I breathe in love, I breathe out gratitude”,. I like to send this out before me each morning. This is also a good way to introduce meditation into your daily routine. I always give thanks for my food before I eat as I am so grateful to have food on my table each day. Say “Thank You” to everyone that takes the time to connect with you whether on social media or in person. When you are struggling with an issue, instead of letting it take over your day, switch the thought in your mind and ask yourself what are you grateful for in this moment and it will make the issue seem a little easier to deal with. In those times of challenges or struggles, ask yourself what it is trying to teach you and be grateful for the awareness of knowing that every experience is an opportunity to learn and grow. When we are grateful, we are more able to help others without wanting anything in return and know that we are helping to make a difference. Every night as you go to bed, breathe deeply and list in your mind all that you are grateful for in that day, you will sleep easier and bring that positive energy into your tomorrows. Keep a gratitude journal, I designed one that has daily guidance and affirmations which helps bring your focus back to the blessings in your life, it also allows you a space each day to write your own thoughts. People who use it say it has helped bring more awareness into their lives.